Legal pad contains 80 sheets of college-ruled paper with a left margin. Sheets are perforated at the top for easy removal and three-hole punched for use in standard three-ring binders. Pad has a stiff back for extra support and durability. Contains 30 percent post-consumer material. 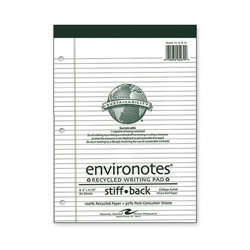 White Ruled Glue-Top Writing Pads from Roaring Spring Paper! 64 In Stock today.